The Water Worker 20 Gal. Pressurized Well Tank offers a direct-fit replacement for the majority of installed vertical well tank bases. The tank's deep-drawn steel construction offers durability, and its polypropylene-lined steel shell supports the water weight to ensure water never sits in loose-fitting vinyl or rubber bags that can fold, crease and wear. The polypropylene liner separates water from the steel shell to help prevent taste or odour from being absorbed into the water. Meets NSF Standard 61 requirements for clean, safe drinking water. Polypropylene liner separates water from the steel shell to prevent taste or odour from being absorbed into the water, formed liner fits the steel shell for added durability. Thick diaphragm keeps water separate from pre-charged air and helps to reduce air loss. Molded diaphragm offers an ideal fit, sits on top of the water and will not fold, crease or drag against the steel shell. Water connection is malleable iron with a stainless steel waterway. The Everbilt 1/3 HP submersible pump is constructed of heavy-duty cast iron and features a PSC motor for energy efficiency and savings. The pump is engineered to pass 1/2 in. solids and features a vortex non-clogging impeller making it an ideal pump for sump, effluent and dewatering applications such as basement sumps, mound systems and septic tanks. Specifically engineered to handle muddy or sandy water, the ST20K is powered by a 208cc Generac engine that pumps up to 158 gallons per minute, so its ideal your toughest applications. With features such as low-oil shut down to protect the engine from damage, its both durable and easy to use. Heavy duty 2 in water pump hose kit with 20ft. green PVC suction hose and 50 ft. blue PVC discharge hose. Kit also includes three worm-drive stainless steel hose clamps. Great for large volume water transfer in agricultural, construction, industrial, municipal/government, and rental applications; dewatering excavations, flood water removal, trash applications, and field irrigation. Manufactured by Abbott Rubber. 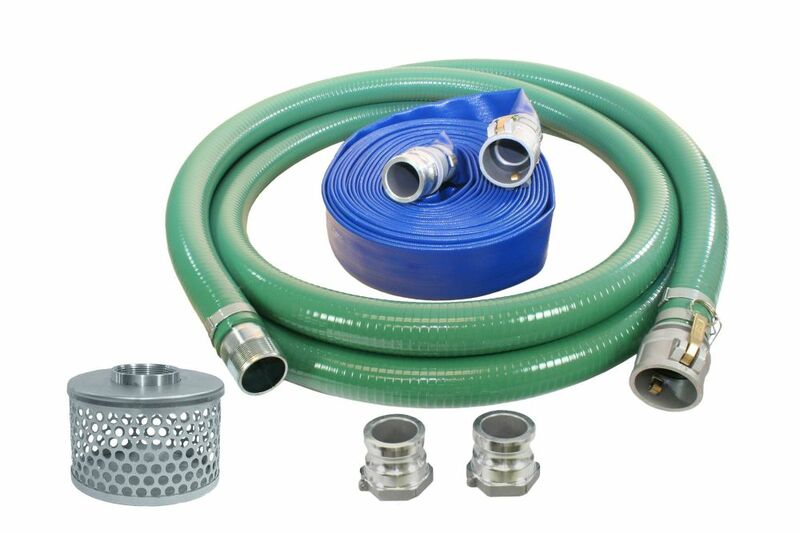 Two inch water pump hose kit is rated 5.0 out of 5 by 2. Rated 5 out of 5 by randy from has everything needed to run a 2in pump works very well quick release fittings are a must.